The 3,5 hour flight from Quito via Guaiaquil to Galapagos took a bit longer than planned, and with the delayed departure we arrived in Galapagos around 1 pm, 1,5 hours late. The airport was quite efficient, except for the very manual baggage system. In addition dogs were checking every suitcase for biological contents, so it took some time. Outside our pre booked taxi driver, Pancho, was waiting. He secured us good seats on the bus to the canal, carried both our suitcases onto the first and fastest boat and into his taxi that was parked on the other side (all taxis are white pickup trucks). In total it took about 1 hour from the airport to Puerto Ayora where we were staying. 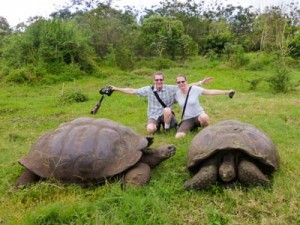 The trip was a good introduction to Galapagos, with sea lions at the canal, a few large turtles along the road and the outskirts of town, and several totally different landscapes/micro climates on the trip across the island of Santa Cruz. 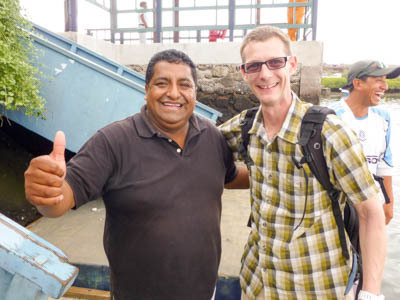 Pancho provided a lot of information and took us on a short sightseeing in the city to show us what we needed to know. 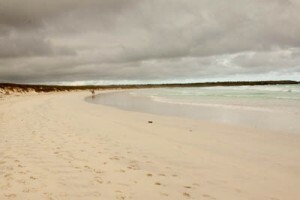 We stayed at the Galapagos cottages, the former location of Tip Top Diving. The first night we were the only guests and had the pool and the backyard all to ourselves. The cottage itself had two floors including a kitchen, a livingroom, two bathrooms, a bedroom and a balcony with a table, chairs and a hammock. Luxury! It is located a few minutes walk from the main street on the quiet road to Tortuga Bay. Puerto Ayora is not a very good looking city, but it has a laid-back charm. Opening hours etc was a bit confusing, and our conclusion was that they were open when it suited them. Most stores sold a little bit of everything. Beer, chocolate and Panama hats was a normal combination. Also the pizzeria served fresh lobster, and the fish restaurant offered hamburgers and taco. You could expect to see wild animals anywhere in the city, mainly iguanas on the sidewalk, smaller lizards on fences and walls, sea lions on piers and rocks, and pelicans and other birds all along the shore. The most fascinating spot was probably the fish market, where boats delivered live lobsters and fresh fish all day. 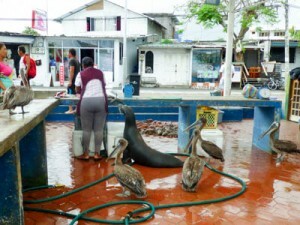 The fish was prepared on site, and several sea lions, pelicans and other birds were begging for leftovers. Our main reason for staying in Puerta Ayora was to get our PADI Open Water certification. 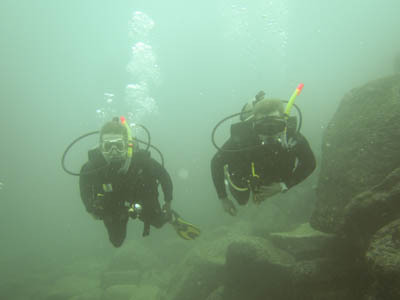 We had completed the theory before we arrived using eLearning, and had booked the training with Tip Top Diving. Our instructor, Jorge, met us at our place and we walked to their new facility. After some paperwork and a theory quiz we found the equipment we needed, had a short briefing and assembled our own scuba kits. We spent about two hours in the pool going through all the tasks needed. Since we had some experience from previous introduction dives, we mastered the skills quickly, even though a lot of them were new to us. Jorge were very pleased and we had a great time. On the second day we were ready to practice our skills in open water. We drove to the dock, and took a small boat to Punta Estrada, our training site for the day. We had two dives to 11 meters, in total about 70 minutes. In addition we practised some skills in the surface. We saw a 1,5 metre white tipped reef shark, lots of barracuda and other fish and had a sea lion circling around us. 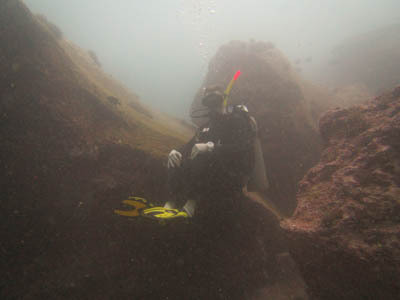 The visibility wasn’t great, but all in all two amazing dives. We really felt that the training in the pool and the fine tuning of the weights/trim had a huge impact. We felt very much in control, moved very easily and used very little air compared to previous dives. On the way back to shore we saw Angelito I (our boat for the Galapagos cruise), and loads of sea lions. We had the afternoons off after scuba training, and also one extra day before starting our cruise. We spent some of this time relaxing in the back yard, had some excursions and walked around most of the city centre. We tasted local chocolate, ice cream and coffe, bought sun hats and other things we needed for the cruise, watched a dance parade in the main street, kids enjoying the city “train” and sea lion families sleeping at the pier. One afternoon we walked by a burning house. Half the city was there, and the hospital across the street had gurney ready on the sidewalk. People were moving shelves and anything of value from the closest stores into the the street while waiting for the fire trucks. Everyone were helping with the hoses and the fire were put out without anyone being hurt as far as we could see. We had a short visit at the Charles Darwin Research Station. 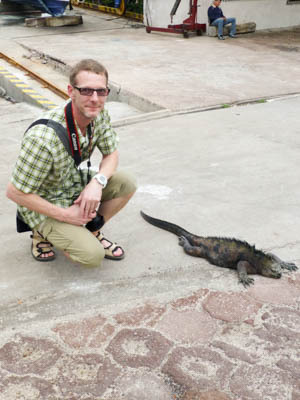 It had a couple of museums, several tortoise enclosures and lots of local vegetation. Other sights are more interesting. We also walked the 3 km trail to Tortuga bay, where there’s a long sandy beach with strong currents (not suited for swimming, but popular among surfers) and a shorter, more protected beach for swimming. There were lots of marine iguanas, crabs and large sea birds and we also saw a few sea lions. The beach was full of tracks from hatching turtles, but the bay is closed in the night when they come ashore. The trail was very nice, but longer than expected. One afternoon we booked Pancho for a trip to the highlands, where we visited Los Gemelos, which looked like volcano craters, but are actually sinkholes. Our next stop was the lava tubes, tunnels formed by the solidifying of the outside of the lava flow. We walked from one end to the other, more than a kilometer. In some parts they were huge and in other parts we had to crawl. Very cool experience! At El Chato Tortoise Reserve, wild giant tortoises were wandering around, most of them in the area available to tourists, but we also saw several of them in other areas, and even had to stop for one crossing the road. Beautiful animals that it was really nice to see up close like this. Before going back we had a beer at the ranch, and Fredrik bought some Galapagos coffee to bring back to Norway.